The Slow Wheels of Justice—Or Is It a Treadmill? The health problems of Secretary of State Hilary Clinton have brought venous sinus thrombosis (VST) into the headlines. Clinton was hospitalized earlier this month for anti-coagulation therapy, following the diagnosis of a clot with the potential to block blood flow from her brain. In an article in Residency Notes, Dr. Patrick Fitzsimmons speculates that the clot could be related to her fall in early December. 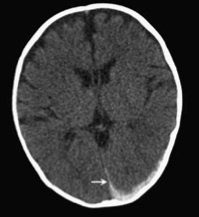 He writes that VST is associated with a number of “procoaguable states,” including trauma and inner ear infections, “but in at least 15% and perhaps as many as 30 or 40% of cases no underlying risk factor or etiology is identified.” He notes that the resulting back-up of cerebral spinal fluid can lead to raised intracranial pressure and cerebral edema, possibly leading to strokes, which “can even be hemorrhagic.” This analysis is consistent with news reports that Clinton’s blood clot could have been life-threatening. Clot specialist Dr. Samuel Goldhaber reports in a video inspired by the news that clots like Clinton’s are “very rare,” estimating that his practice sees maybe six new cases a year. One of the reasons I find all this so fascinating is that one of the speakers at the Boston conference this past fall characterized VST as the new “courtroom diagnosis” for SBS. Today’s New York Post coverage of Hang Bin Li’s murder trial focused on a surprise appearance in the gallery by actress Katie Holmes, whose publicist told the press she was there to support her friend Leigh Bishop, the prosecutor. Holmes reportedly arrived wearing no makeup and in the company of an unnamed companion, and stayed through Bishop’s opening arguments. Li Dongyong, who is now a sushi chef in Toronto, testified in Chinese through an interpreter. He said that he knew both Mr. and Ms. Li, stretching back to elementary school in Fujian Province in China. And he set the stage for the events, saying that on the day Annie fell ill, he rushed to the apartment in Flushing and saw that the baby was pale and feverish, but that he never saw Mr. Li strike or otherwise physically harm the child. The parents decided to wait before calling 911, he said, but shortly after midnight, he heard them frantically trying to wake Annie, who had turned blue and unresponsive. He said he saw Mr. Li trying to rouse the baby. The Lis say 2-month-old Annie deteriorated for unknowns reasons. The prosecution says Hang Bin Li shook and slammed his daughter to death. The article in today’s Times Ledger (serving Queens since 1919) leads with the support Hang Bin and Ying Li have received from their community, and it covers both the defense and prosecution positions regarding the dropping of charges last week against Ying Li. This web site offers ongoing updates on the trial and links to the Chinese-language coverage. In Texas last week, Ernie Lopez pled guilty to a lesser charge rather than face a new trial and possibly more time in prison. His 2003 conviction for aggravated sexual assault of a 6-month-old girl was overturned last year, after his case was featured in a series on changing child-death forensics that ran in NPR, Frontline, and ProPublica. He was released last winter. This time, the prosecution was moving forward with a murder charge. According to last week’s NPR report on the plea agreement, Lopez confessed to “injury to a child by causing serious bodily injury,” based on testimony from a polygraph expert that Lopez said he might have penetrated the girl while cleaning her up after a messy diaper. Lopez has denied making those statements in the past. Last year, Lopez explained that the first time he went to trial he believed innocent people don’t get convicted. Then he spent nine years in prison. This time, he would have had key medical experts and a more developed defense. Yet he still faced the risk of conviction. The Amarillo Globe-News offers a more traditional slant on the story, with the headline, “Amarillo man admits shaking baby before she died.” While the commenters on the NPR web site have been reasonably sympathetic to Lopez, the Globe-News comment section brims with vitriol at a presumed abuser. One writer scorned the prosecutor for not pressing a case he wasn’t sure he could win. As part of the plea agreement, Lopez was required to admit to the state’s allegations and agreed that the state could prosecute him again if he ever asserts that he did not commit the crime. Hello, I just created a new blog page to devote Daily Trial coverage of the Hang Bin Li trial. Make sure to read Day 2 of the Trial. Please tell Phil Locke at Innocence Project to read it. I expect more “juicy” medical testimony to come in the coming weeks.